The bench I built here was quick, dirty, cheap, and quick. I just got tired of working on my garage floor, both working on things for my VW Bus and my growing interest in "real" woodworking (as opposed to just cutting crap with a jigsaw). Tough to withstand being moved around. Lots. 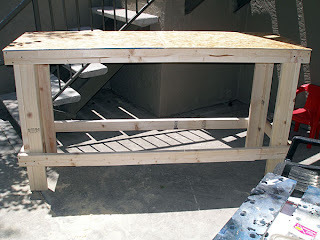 I saw a plan online somewhere (I forget where now) that showed a screw-together bench similar to what I ended up doing. L-shaped legs with wraparound stretchers. The plan showed a substantial joined 4" thick top. But I had no face joining skills so I went with some scrap fiberboard I had. 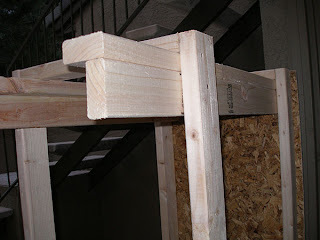 The legs and stretchers are simply cheap pine 2x4's from Lowe's. They had a sale, $1.49 each for 2x4x8's. I bought a stack and a pound of 2" deck screws to put it together. 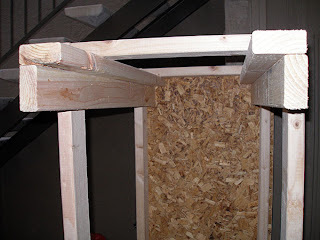 I cut everything with a WalMart circular saw (that works REALLY well, a nice bonus in a $25 saw). The legs are 48" and the bench is 6 ft long by 2 feet deep. I made it a bit taller than most benches because I didn't/don't plan on using it as an assembly table, but instead want to be able to sit on my stool and work comfortably. The legs are joined with 4 screws for each pair, then the stringers are attached with 2 or 3 screws at each joint, at least one screw into the short stretcher, and one into the paired legs. I lined up the top stretchers flush with the top of the legs to give support for the benchtop. This gives enough support to my 3/8" fiberboard that it doesn't flex except under extreme conditions. Putting a complete 2.0l VW engine on it flexed it a bit. I used screws without glue because I figured at some point I would want to change it or design a new bench altogether. Using screws gives me the option of tearing the bench down and recovering the wood for other projects. It currently has no shelf on the bottom. I had intended to get a sheet of MDF or something to make the bottom shelf, but decided to leave it open. Because I work in a one car garage attached to my apartment, space is at a premium. I'm able to store lots of boxes and cases for crap inside the bench, and still put my 8" Black & Decker table saw in there when it's not being used. I recently scavenged some drawers from a waterbed frame. These I mounted under the bench top using some scrap 1x2's. It's nice having a place to put things like goggles and manuals that won't get covered in sawdust! I still haven't decided on what I *really* need in a bench. There are many options, but until I do more work I won't know which options I'll use and which just look pretty. So this bench will get quite a bit more use before I give up on it. 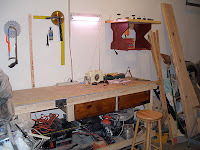 UPDATE 9/24/07: Here's a pic of the bench in my garage/shop. You can see the drawers I added and all the crap underneath.